GERMANY: Certification and advisory firm DNV GL has confirmed designs for Siemens' 8MW offshore wind turbine reach international standards, meaning a prototype can be installed. Siemens revealed the SWT-8.0-154 turbine in July 2016. DNV GL said Siemens' design had met standards in accordance with the IEC 61400-22 criteria. 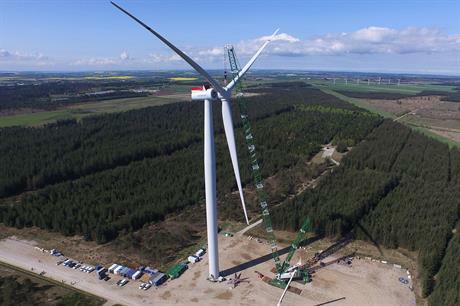 It means Siemens will be able to install a prototype of the turbine at Denmark's national test centre in Osterild, where its 7MW predecessor has been in testing since May 2015. "We are proud to have received the prototype certificate at this early stage, allowing us to install our SWT-8.0-154 prototype according to plan, said Siemens head of wind power technology Morten Rasmussen. "The third evolution on the offshore direct-drive platform truly marks the move towards industrialising offshore wind power," Rasmussen added. The 8MW model has evolved from the 6MW unveiled in 2011, which was then upgraded to 7MW at the EWEA Offshore conference in Copenhagen in 2015. The upgrade was made possible by improved magnet technology to increase output, Siemens said. Because only a few components require upgrades to boost capacity, Siemens said the turbine would benefit from a faster time to market. Final type certification is expected in early 2018.